What I wouldn't give to still have a student ID. 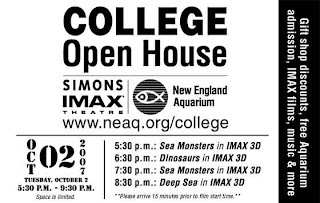 The New England Aquarium is hosting their College Open House tomorrow, Tuesday 10/2 from 5:30pm to 9:30pm. Your college ID gets you in for free to the Aquarium as well as the IMAX theatre. Space is limited and it's first come first serve. 0 Response to "New England Aquarium College Open House"